Budgeting is at the core of planning a new kitchen. Not only do you have to plan the kitchen and cost everything involved, you may also have to factor in the kitchen fitters. London has plenty of interior designers, kitchen stores and DIY outlets. Some will design or help design the kitchen with you. Some will even have their own fitters to install it. If not, there are plenty of London builders who can help. My London Builders is one such company. 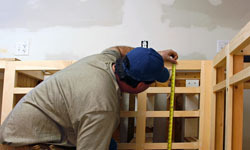 We have years of experience fitting kitchens, bathrooms and all sorts of other construction projects. Feel free to give us a call, or use the contact form on this page. Just don’t leave it until the last minute! Having a kitchen designed and installed is the very best option. But you pay for the privilege. These types of installations will cost much more than an off-the-peg one but will be far superior in design, build quality and materials. These bespoke kitchens will often be fitted by the suppliers own installers, so the cost should reflect this. If they don’t offer installation, factor around 50 percent of the cost of the hardware for your own kitchen fitters. London has only one form worth calling, that’s My London Builders. There is a lot involved in replacing a kitchen. There is the obvious, the cabinets, worktops, and appliances, but there is also tiling, decorating, plumbing, electrics, and flooring, to name a few. If your new kitchen matches the footprint of the old one, the upheaval should be minimal. If it’s part of an overall redesign, you have to factor those extra jobs in to the cost, and schedule. How much do you use the room? Do you need a breakfast area? Do you use the kitchen for family time or other uses? Are you changing the design or replacing a tired kitchen? Do you want a combination of wall and floor cupboards? Do you want freestanding or fitted units? What kind of cooker do you want? Freestanding? Wall mounted? Integrated? Do you want to keep the appliances in the kitchen if that’s where they are? Do you have a utility to move them to? Will an extractor hood above the hob be sufficient? Open plan areas may need more. Is there adequate storage for all your kitchen equipment on your plan? Is there enough worktop space for food preparation? Where are you going to plug in and use the kettle, and occasional items like a toaster or food processor? Do you want display storage for certain items? Things like recipe books? You will need to answer these questions before you talk to a designer, and long before you talk to any prospective kitchen fitters. London has many sources of inspiration, and the possibilities are only really limited by the space available and the budget. We can of course go through the options with you, but the job gets done much quicker if you have all the answers from the off. The core advice really is to buy the best your budget allows. If you can stretch to a fully designed and fitted bespoke kitchen then go for it. It could add up to 10 percent to the value of your home. Alternatively, the standard of ready-made kitchens is high now that they are a perfectly viable alternative. Many will come with fitting, others will need a friendly My London Builder to help. Whatever you decide, do yourself a favour and plan it a little first. It will speed up the process no end, and will help build a picture in your head of an achievable kitchen, not just a dream one. Once you’re ready, give us a call and we’ll come take a look. My London Builders have the experience and skills to do the job.